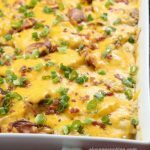 This super creamy scalloped potato casserole is one of those comfort meals that you can remake over and over again–it’s seriously that good. 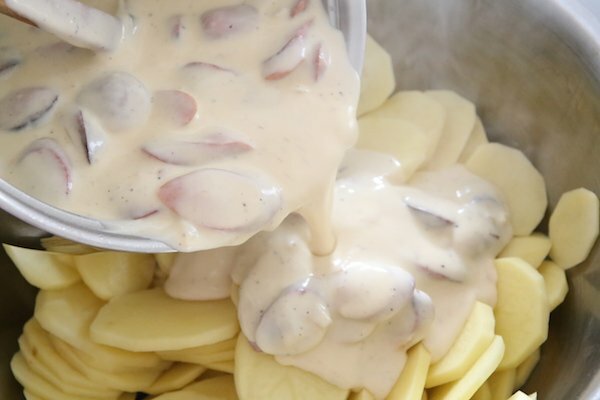 Sliced golden potatoes are tossed in a creamy cheese sauce along with some sliced hot dogs creating one loaded with flavor meal. Kids even happen to enjoy this dish and it happens to be very versatile as you can use sausage, bacon or keilbasa for the hot dogs. 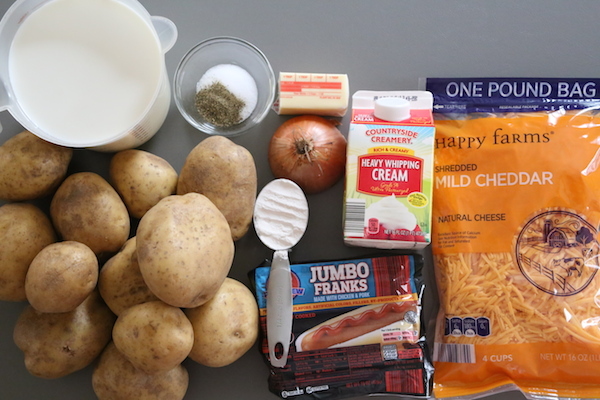 I personally really like the hot dog variation (it just goes so well with potatoes.) Cheddar cheese is a must as it melts into creaminess unlike some other cheeses that can get quite stringy. 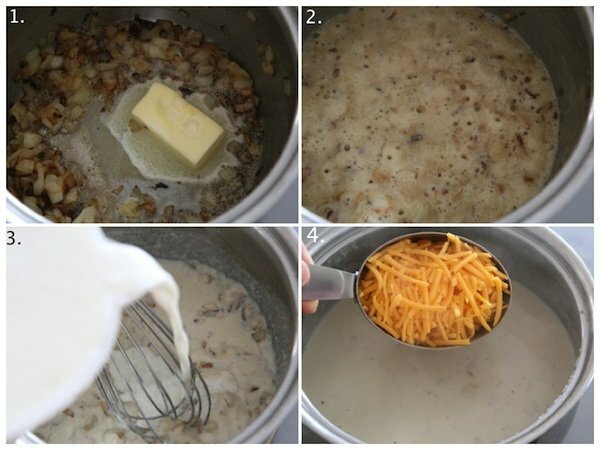 If you happen to have some left overs, no worries because it reheats very nicely and still stays creamy after reheating. Do try this dish as it has truly been one of those satisfying meals we’ve really enjoyed. 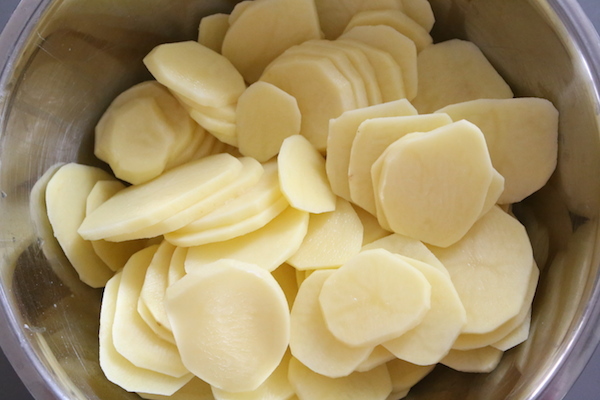 Peel, wash and slice potatoes into 1/4″ slices; place into a large bowl and set aside. 2. Slice the hot dogs into diagonal slices and broil until nicely browned; set aside. 4. Add the butter and melt over medium heat. Then add the flour and whisk until bubbly. Slowly pour in the milk and cream, whisking until sauce slightly thickens. 5. Turn off stove and remove saucepan from heat. 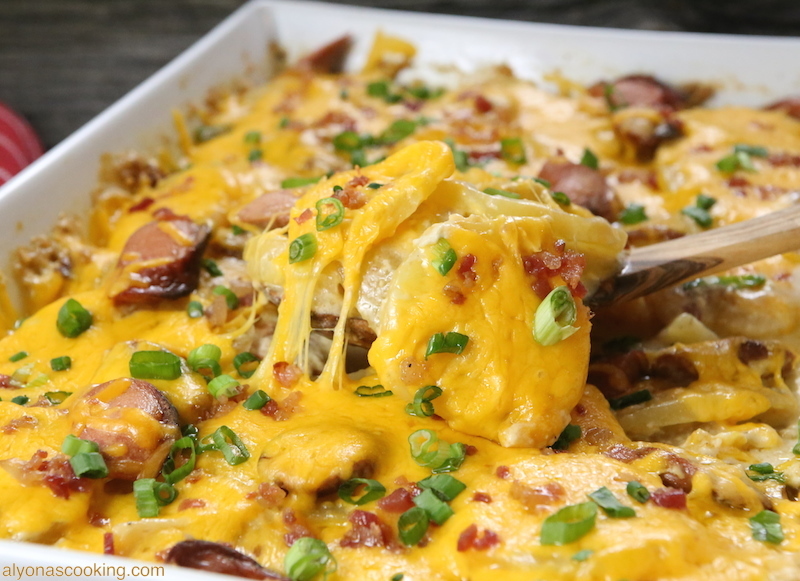 Add in the cheddar cheese and whisk until melted. 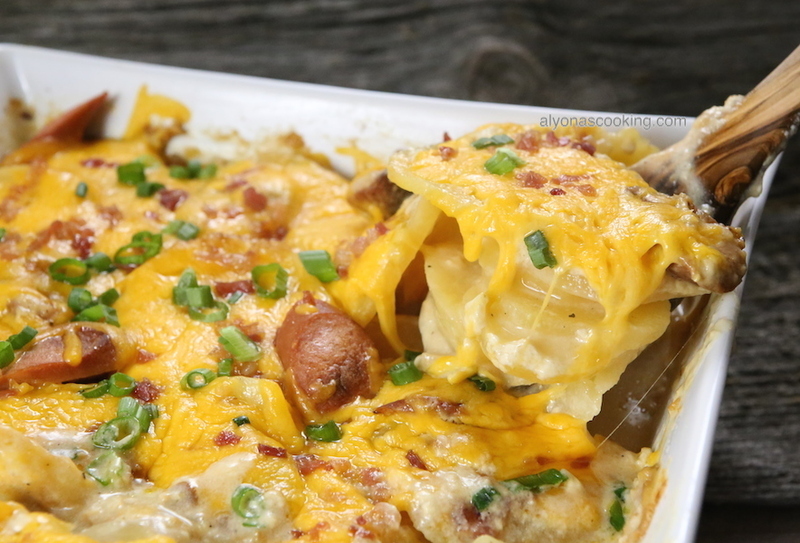 Then stir in the hot dogs and pour sauce over scalloped potatoes. Toss everything together. 6. Spray a 13 by 9-inch baking dish with cooking spray and pour 1/2 cup of water onto the bottom. 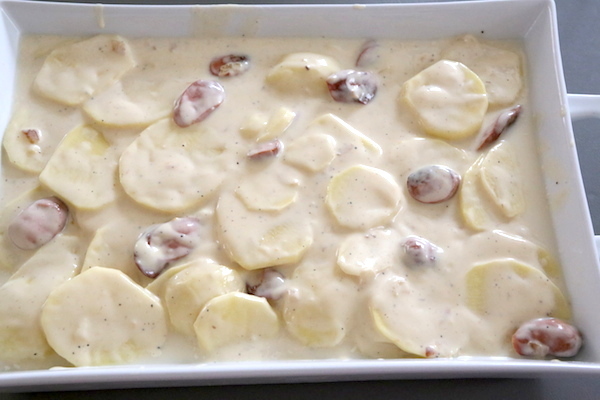 Add in the potato mixture and bake covered for 2 1/2 hours. 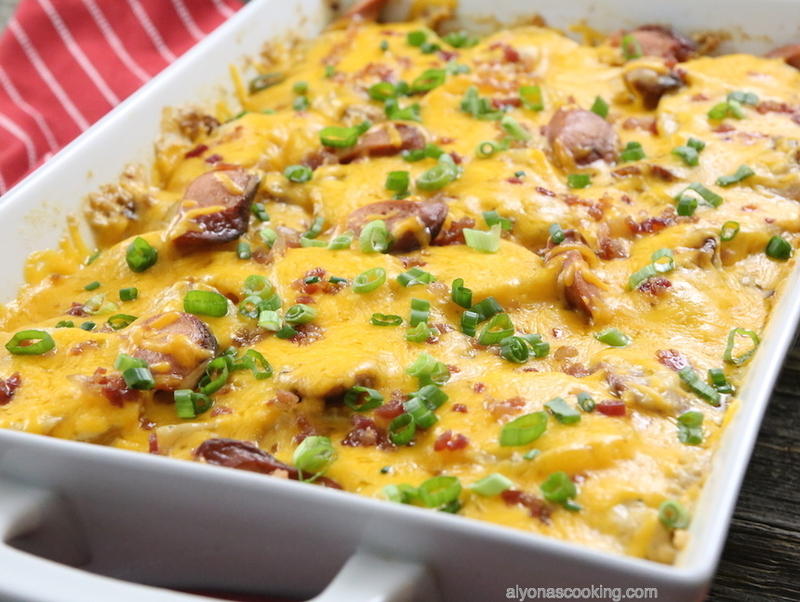 Then uncover; sprinkle 2 cups of cheddar cheese and bake opened for another 10-15 minutes. Peel, wash and slice potatoes into 1/4" slices; place into a large bowl and set aside. 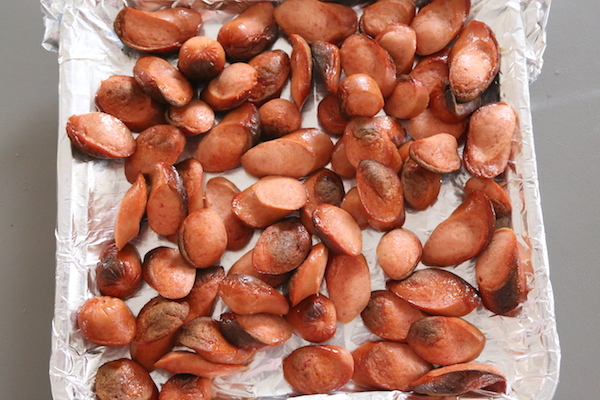 Slice the hot dogs into diagonal slices and broil until nicely browned; set aside. Add the butter and melt over medium heat. Then add the flour and whisk until bubbly. Slowly pour in the milk and cream, whisking until sauce slightly thickens. Turn off stove and remove saucepan from heat. Add in the cheddar cheese and whisk until melted. 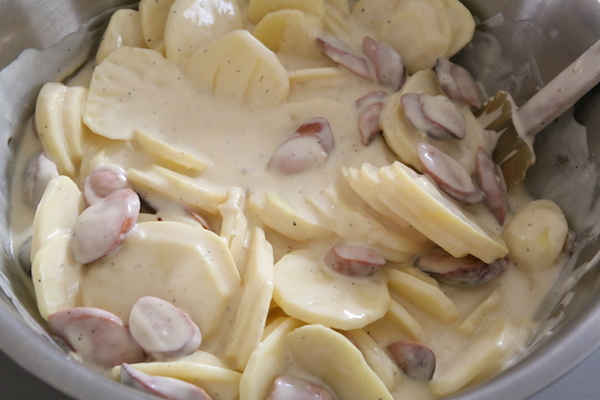 Then stir in the hot dogs and pour sauce over scalloped potatoes. Toss everything together. 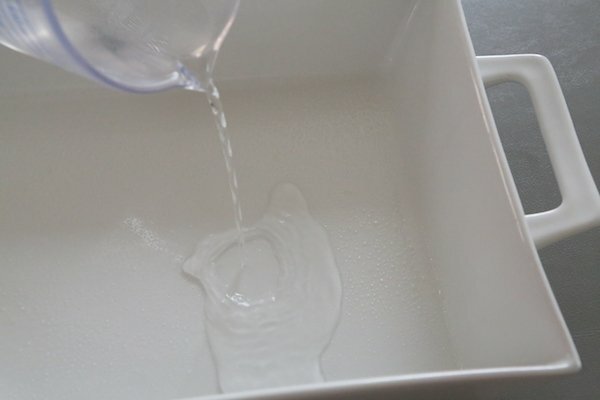 Spray a 13 by 9-inch baking dish with cooking spray and pour 1/2 cup of water onto the bottom. Add in the potato mixture and bake covered for 2 1/2 hours. 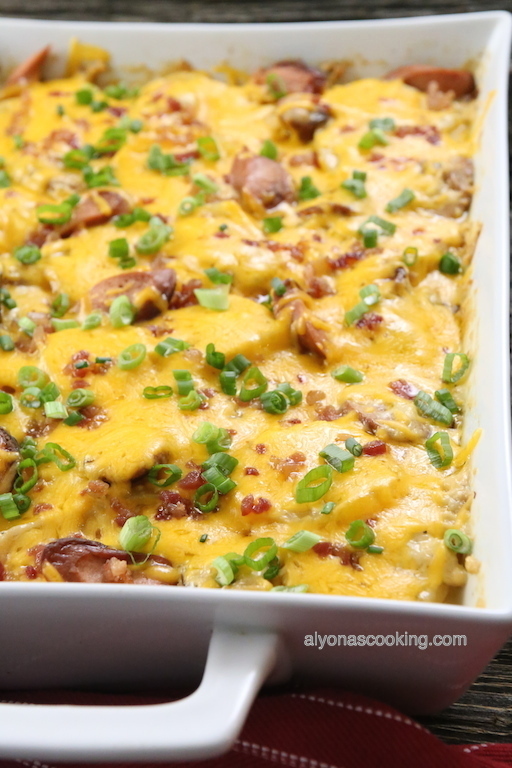 Then uncover; sprinkle 2 cups of cheddar cheese and bake opened for another 10-15 minutes. Garnish with bacon bits and scallions, if desired. NOTE: My baking dish was about 3″ deep so you may need a bigger baking dish if using a less deeper dish when baking.